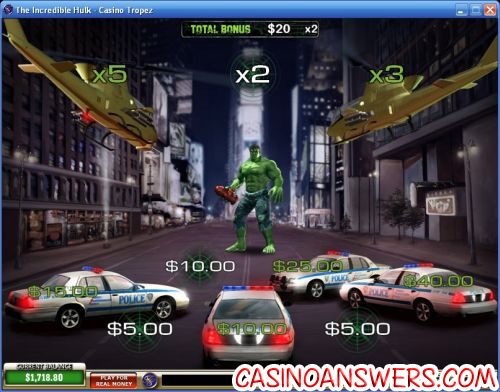 Incredible Hulk Movie Video Slot Guide & Review - Casino Answers! The Incredible Hulk is a 5-reel, 25-line Marvel video slot based on the 2008 film that starred Edward Norton as The Hulk and Bruce Banner. It features the Smash Bonus game, Expanding Wilds, free spins and a Marvel Multi-Level Progressive Jackpot. You can find the Incredible Hulk movie video slot at Playtech casinos such as Casino Tropez.Play at this years #1 online casino for United States - Slots.LV. All Marvel video slots found at Playtech casinos are linked to four Mystery Marvel Progressive Jackpots called Power, Extra Power, Super Power and Ultimate Power. Each jackpot is won randomly, meaning any spin you make can take you to the Jackpot Game. Your chances of triggering the Jackpot Game are increased based on your bet. The Incredible Hulk Jackpot Game consists of a grid of 4X5 squares – 20 in total. Click on the squares to reveal jackpot symbols. You have to match 3 identical jackpot symbols to win a jackpot. The Jackpot Game has a timer, so that if you take too long on your turn, one of the jackpots will be paid automatically. The Incredible Hulk Marvel slot is fun for comic fans, movie fans and gamblers alike. Head over to Casino Tropez and you’ll enjoy the excellent graphics, sound effects and animations. If you get a big win, make sure to tell us about it! Does the Hulk movie slot machine have any Progressive Jackpots? 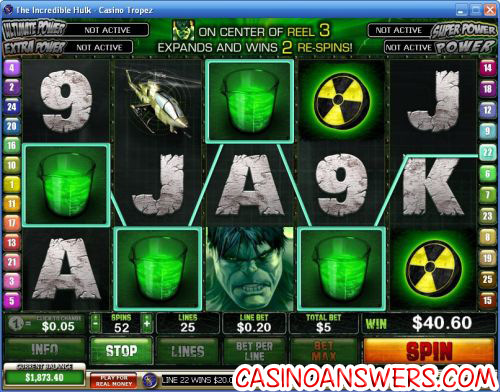 Playtech’s Incredible Hulk game found at Casino Tropez has four randomly won progressive jackpots. Any spin you make can win, but you can increase your chances of winning by making a larger bet. I’m a US-based online casino player. Can I play the Incredible Hulk video slot? Unfortunately, none of the Playtech Casinos are currently accepting players from the United States. However, if you want to play storyline-based video slots called iSlots that are a lot of fun in their own right, we suggest you check out Vegas Days Casino.